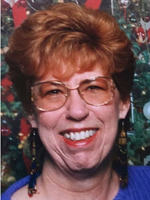 Vickie Schon Obituary - Oak Harbor, Washington | Whidbey Memorial Funeral & Cremation Service, Inc.
Vickie Schon passed away March 20, 2019 after a short battle with cancer. She was born in Long Beach, California on August 22, 1946. She loved the desert but learned to like the Northwest. No one was a stranger to her, and she was loved by all who knew her. She is best known for her compassion and her sense of humor. Her passing will leave a big hole in her community. She is survived by her husband Rick Schon; her daughters Verna Haynes and husband Ed; Pam Tellefsen and husband Ray; her grand-daughters Grace and Kara Tellefsen; her sister Peggy Wandell and husband Jim; her sister Lynn Ward and husband Vic; nephews Shawn, Gavin and Gerald; nieces Dawn and Nico; many cousins and many “adopted” family. In lieu of gifts or flowers, the family suggests memorials to your favorite charity. Her services will be announced at a later date. Arrangements have been made with the assistance of Whidbey Memorial Funeral and Cremation Service.